Background: Early diagnosis is an important factor to improve the survival of Invasive Cervical Cancer (ICC) patients. Molecular biomarkers such as micro RNA (miRNA) can be used in the early detection of ICC. The expression of miR-21 and miR-29a are deregulated in many types of human cancers. Objective: The aim of this study was to investigate the differences in miR-21 and miR-29a expression patterns in the Human Papilloma Virus (HPV) infection and various grades of cervical cancer among Iranian women. Methods: Small RNAs were extracted from positive for HPV, cervical cancer and healthy samples from 43, 50 and 46 individuals, respectively. Expression levels of miR-21 and miR-29a were analyzed by SYBR Green real-time RT-PCR using specific primers, and 5s rRNA as the internal reference gene. Results: Results have shown a significant increase in miR-21 and decrease in miR-29 in cancerous samples in comparison with the control groups (P < 0.0001). Conclusion: This study illustrated that miR-21 and miR-29a could be operated as an oncogene and tumor-suppressor in cervical cancer progression. 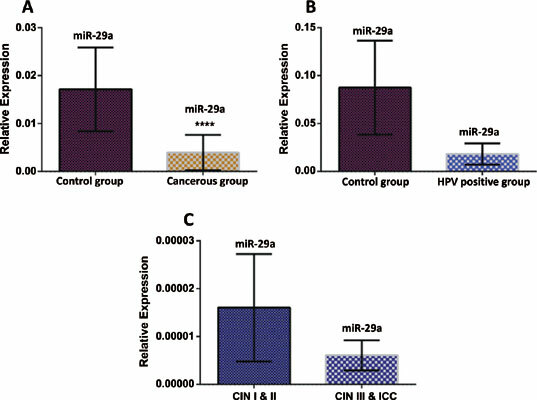 More studies are needed to demonstrate the role of miR-21 and miR-29a as potential biomarkers for the diagnosis of cervical cancer in future investigations. Keywords: Biomarker, cervical cancer, HPV, infection, microRNA, miR-21, miR-29a. Keywords:Biomarker, cervical cancer, HPV, infection, microRNA, miR-21, miR-29a. Abstract:Background: Early diagnosis is an important factor to improve the survival of Invasive Cervical Cancer (ICC) patients. Molecular biomarkers such as micro RNA (miRNA) can be used in the early detection of ICC. The expression of miR-21 and miR-29a are deregulated in many types of human cancers.